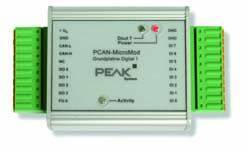 This page describes the Peak Industrial strength Data Acquisition systems that are configured via simple PC based Windows Applications. The advantage of this configuration process is that no programming expertise is required and configurations may be rapidly created and changed. They all need a PEAK-CAN interface for the initial loading of fresh configurations but after that can of course be read and written to by any valid CAN interface. It's a rather artificial separation but on our Programmable CAN Controller page we have a number of units that require the user to program the modules. 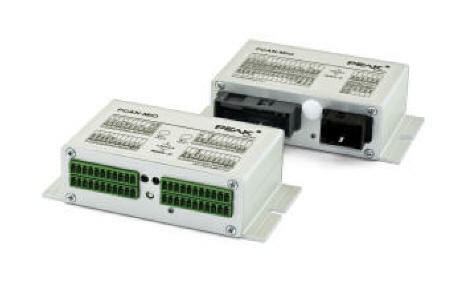 This gives much more control and flexibility but requires a greater investment in time to program the unit in C.
These Industrial I/O modules use the PCAN MicroMod board described on another page to provide a ready made data acquisition system. They are available with a number of the most useful signal conditioning alternatives plus termination in an industrial case. At 51 x 60 x 20mm, they are suitable for a wide variety of applications. Each unit is supplied with a preconfigured MicroMod board installed on a signal conditioning motherboard in an all-metal casing. The electrical connections provide snap-in termination; with a screw connection as an option. Speed is settable up to CAN High Speed typically 500k Bits/s and up to 32 Modules may be put on a CAN network. Standard supply is push in connectors, screw are available as an option. CAN Open compatible firmware is also available at no extra charge for all Industrial modules. 8 digital outputs High-side drivers, 350 mA continuous current, 500 mA short-circuit current. For the larger Digital data collection application the MIO is a universal, modular controller for use both in the industrial and automotive fields. The module has two CAN interfaces as well as multiple analogue and digital inputs and outputs. Incoming signals can be processed by the MIO's microcontroller and then forwarded to either of the CAN interfaces or output channels. The behaviour of the PCAN-MIO Module can be freely configured using a comprehensive Windows® software package. A large number of function blocks and other settings are available to help the user in creating the a configuration. A bus structure also enables expansion of the number of inputs and outputs with additional modules. Customer-specific requirements can be implemented on this bus. 2 High-speed CAN channels via pluggable transceiver modules so that can be replaced by Low-speed, Single-wire, or opto-decoupled High-speed modules, as well as High-speed modules without a wake-up function. 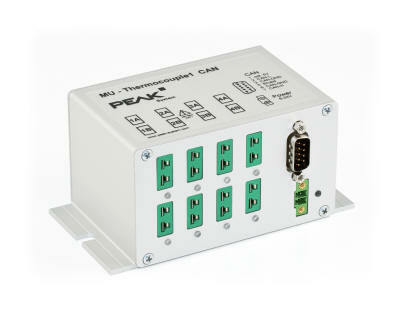 The Thermocouple Measuring Unit offers connections for 8 thermocouple with selectable temperature ranges (J, K, T). Measurement data can be pre-processed and transmitted via CAN bus using a central microcontroller. Configuration is done using a simple PC based Windows Applications and loaded whenever a change in the configuration via a Peak CAN interface.